The summary seems interesting. I've never read Monsters. Just what exactly is the monster in Alex's head? I hope to find out by reading. What did I like about the summary? What's NOT to like? This book is a lot longer than what I prefer (because my attention span is a lot shorter than I prefer), but it sounds like several novels all rolled into one, and that idea intrigues me. That, and having a monster in your head sounds pretty cool! I have recently gotten into dystopians and this one sounds really exciting. Thanks or the giveaway opportunity. I love dystopian/apocalyptic stories and a bit of horror so this series is perfect! 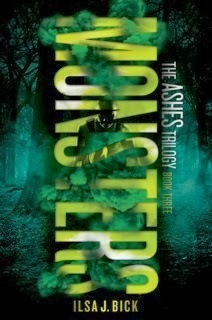 I've read some great reviews for Ashes and the summary of Monsters indicates there's more of the same excitement to come. Thanks for the chance to win a copy.